Do you know all your choices for ortho? Did you know that the use of orthodontics goes all the way back to ancient times? Around 400-300 BC, Aristotle and Hippocrates investigated methods to align teeth and repair different dental conditions. Archeological digs have turned up numerous mummified remains with metal bands strapped around their teeth. Even Cleopatra is said to have had teeth bound with wire. It wasn’t until the 18th century that orthodontics really began to develop as a profession. French dentist Pierre Fauchard is often credited as the father of modern orthodontics. His book, “The Surgeon Dentist,” documented methods to straighten and align teeth. Another French dentist, Louis Bourdet, published “The Dentist’s Art” in 1754, which also dedicated a chapter to orthodontics. Bourdet was the first dentist on record to recommend extracting the premolar teeth to alleviate crowding and promote better jaw growth. Now, more than 250 years later, orthodontic practice is much more developed and refined. 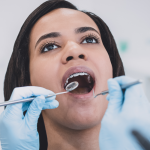 With our ability to craft custom-made braces and other orthodontic materials, a variety of options for teeth straightening are on the table. 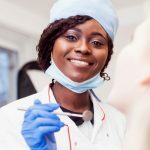 Penn Dental Medicine offers many cutting-edge treatment methods, allowing patients to choose according to what best fits them and their needs. 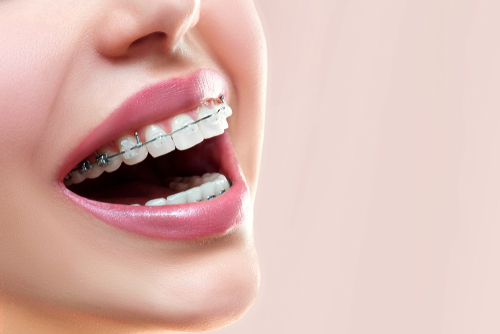 You may already be familiar with traditional metal braces. 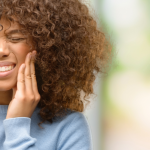 Metal braces are highly recommended for patients with extreme overcrowding and misalignment because they’re the most effective treatment for these conditions. Brackets are made of metal, which are cemented to the teeth. A metal wire or “arch wire” connects the brackets. Traditional braces function through gradual tightening, which moves the teeth into proper position. Ceramic braces work the same way as and have all the same components of traditional braces, differing only in the materials. 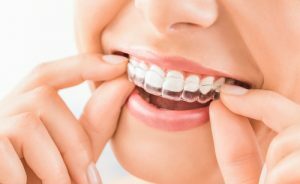 Instead of metal, the braces are made of transparent ceramic, making them much less noticeable. Ceramic braces are well-suited to patients without severe misalignment issues. Your orthodontist will let you know if you’re a candidate for ceramic braces once they’ve examined your teeth. In some cases, treatment time may be longer with ceramic braces than it would be with metal ones. Lingual braces were originally created by an orthodontist who wanted to give his celebrity clients a less outwardly visible way to straighten their teeth. Now, lingual brace technology makes straight teeth possible for anyone who wants a more subtle form of treatment. 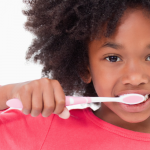 Because they are located on the inside surface of the teeth, they are completely invisible. Their protected position on the inside of your mouth also make lingual braces the ideal choice for athletes and musicians that play wind instruments. Lingual braces are custom-developed for each patient, making them effective for patients with a wide range of orthodontic conditions. Invisalign takes a completely different approach to orthodontic treatment. Like lingual braces, Invisalign clear aligners are custom-manufactured for your particular prescription. Unlike any of the previous options, however, Invisalign is removable and is designed to fit over your teeth. Many of our adult and teen patients enjoy the aesthetic appeal of Invisalign, as well as the convenience of being able to keep eating all their favorite foods! There’s one thing these options have in common: the results. No matter what option you choose, you’ll end up with an attractive smile! 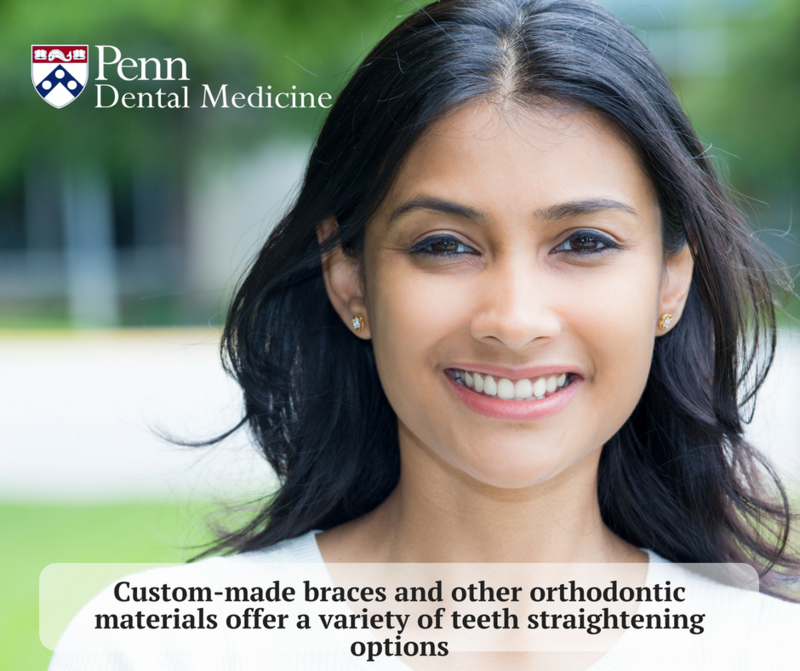 At Penn Dental Medicine, you can get orthodontic treatment for lower costs than you’d find at your average dental clinic. Because we understand orthodontia can be a significant investment for many families, we hope you’ll take advantage of our unique offer and investigate your options to straighten and align teeth with us. To make your appointment, please call our office at 215-898-8965.